Why go to the store when a birthday, graduation, wedding or even a time for expressing gratitude comes up when you can have 20 cards at your fingertips! 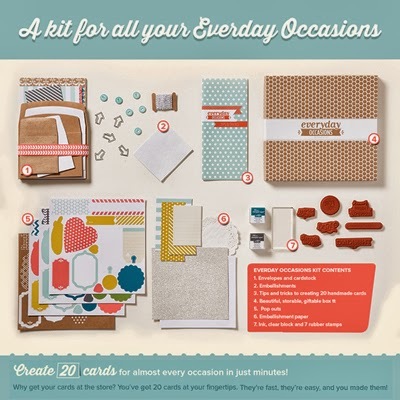 The Everyday Occasions Card Making Kit puts cards for all those events right your finger tips, and the best of all, they'll be handmade! The kit contains everything necessary (minus the adhesive and scissors) to create 20 beautiful cards for almost any occasion and it comes in a beautiful box to store them. The best part...you get over $50 worth of cardmaking joy for just $29.95! Available for purchase now!